In the Preface he wrote for the first edition of Leaves of Grass in 1855, Walt Whitman called for a race of poets to make use of the United States, with its “veins full of poetical stuff,” and predicted that the States would make use of the poet as “their common referee.” The great poets were to come from the people and keep the Republic on a course toward perfect equality. The American poets are to enclose old and new for America is the race of races. Of them a bard is to be commensurate with a people. To him the other continents arrive as contributions. His spirit responds to his country’s spirit… An individual is as superb as a nation when he has the qualities which make a superb nation. The soul of the largest and wealthiest and proudest nation may well go half-way to meeet that of its poets…The proof of a poet is that his country absorbs him as affectionately as he absorbed it. Whitman absorbed the spirit of America, and in return was absorbed by it, but what of the race of poets who he hoped would carry on his work? 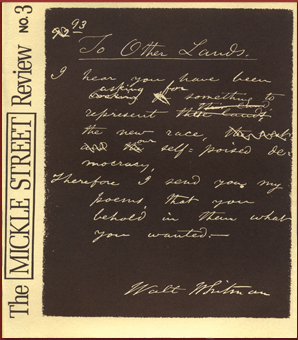 For this issue, the Mickle Street Review asked for poetry that was “commensurate with a people,” that reflected the poetical stuff that flows in America’s veins more than a century and a quarter after Whitman wrote his Preface. His efforts of modern poets to meet their country halfway compose the principal theme of this issue. The editors would like to acknowledge with gratitude the sponsors of the Mickle Street Review, Mrs. Doris Kellogg Neale; Camden College of Arts and Sciences, Rutgers University; and University College/Camden, Rutgers University.